Although they eventually fall out, your child’s primary teeth serve an important role while they are in place. They help them learn how to chew and speak while also acting as placeholders for the adult teeth. The biggest threat to the health of their baby teeth involves tooth decay. While it is preventable, it remains the most common chronic conditions in America. 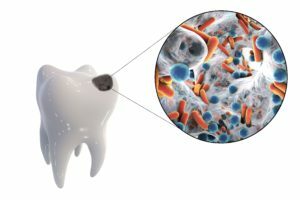 In fact, the Centers for Disease Control and Prevention estimates 20% of children aged 5 to 11 and 12% of adolescents have at least one untreated cavity. Your pediatric dentist in Northampton encourages you to follow a few simple tips to keep your child’s smile cavity-free. Your child’s home oral hygiene habits are their first line of defense against tooth decay. As soon as the first baby tooth erupts, it is time to introduce a toothbrush. Choose one that accommodates the size of their mouth and one that has soft-bristles. Brush their teeth twice a day using a fluoride toothpaste, which helps to strengthen their enamel. As your child’s teeth begin to move closer together, around the age of 6, it is time to start flossing. Choose a high-quality dental floss that has earned the American Dental Association’s Seal of Acceptance to clean in between each tooth daily. Your child should visit their dentist for the first time before they turn 1 year old. This allows your dentist to keep their teeth clean while also monitoring the development of their teeth. Besides a cleaning and checkup, semi-annual appointments allow your child to enjoy preventive treatments that can reduce the occurrence of decay, like a fluoride varnish or dental sealants. Foods that are high in sugar or acid slowly eat away at your child’s enamel. In as little as 20 minutes, they can begin to dissolve the outer layer of their teeth. It is best to limit their consumption of sugary or acidic foods and drinks. Instead, choose plenty of low-fat dairy products, fruits, and vegetables. Certain bad habits, like going to bed with a bottle, harm your child’s dental health. The sugars found in fruit juices or formula sit on their teeth throughout the night, leading to decay. It is best to break the habits as soon as possible or only give them water when going to sleep at night. Although tooth decay is common, you can help keep your child’s smile cavity-free with a proactive approach at home. Ask your dentist about other tips you can use to nurture the health of your child’s smile. Northampton Pediatric Dentistry PC provides compassionate dental care to young patients. We strive to create a foundation to ensure lasting oral health. We offer the complete services your child needs through all stages of development. If it is time for your child’s next cleaning and checkup, contact our office today to schedule an appointment.